Despite winning three straight over Atlanta (27-13), Houston (27-24) and Jacksonville (27-14), no one is talking about the Cardinals. Offensively, Arizona quarterback Carson Palmer might be on the verge of turning things around after going 30 of 42 for 419 yards with two touchdowns and no interceptions during last Sunday’s 27-14 win at Jacksonville. Coming off the second-best yardage day of his career, Palmer has completed 68.5% of his passes with six touchdowns and two interceptions in the last three games. Meanwhile, both teams appear to be heading in opposition directions on the defensive side of the ball. Over the last three weeks, Indianapolis has allowed 29.7 points per game at 10.1 yards per pass attempt, 6.9 yards per play and 13.4 yards per point. In contrast, Arizona is limiting opponents to a mere 17.0 points over its last three games at 2.6 yards per rush play, 4.6 yards per pass attempt and 267 total yards (4.1 yards per play). Overall, Arizona is 0.6 yards per rush play, 0.7 yards per pass attempt and 0.6 yards per play better than average defensively this season, which is certainly good enough to slow down Andrew Luck & Co.
I’m not sure if fans and bettors alike are aware of the fact that the Colts’ offense is only 0.1 yards per play better than average, while being 0.1 yards per pass attempt worse than average. In short, we have a small home favorite that is superior on both sides of the ball and is facing a struggling Indianapolis team that is -69 yards per game since September. Let’s also note that the Colts are a money-burning 7-12 SU and 6-12-1 ATS versus NFC West opposition following a win. My math model actually favors Arizona by six points and both the fundamental and technical analysis also favors the Cardinals. Finally, there may not be a coach in football who is more familiar with the Colts than Arizona head coach Bruce Arians, who led Indianapolis to an 8-3 record on an interim basis last year when Chuck Pagano was battling leukemia. 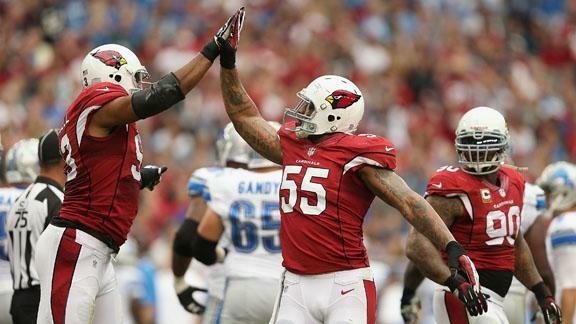 Arians is now in Arizona and looking to lead the Cardinals to their fourth straight win. The Cardinals are 5-0 SU and 4-0-1 ATS in competitively-priced games (+3 to -3), whereas the Colts have been outgained by 83 yards per game in competitive games on the road. Lay the points with one of the most underrated teams in the NFL and invest with confidence.